There are times where it feels like everything is going against you. After a really solid start, we hit our first major challenge, and lost a key man for the rest of the season thanks to a broken leg. Thankfully this young squad is mentally tough, and has shown remarkable determination! The two Jack Smiths up front have interchanged well dependent on situation and tactics, though the on-loan Raith man took hold of the regular starting berth beside Paolo. Scoring nine goals in nine games tells its own story about how vital he had become… until his season was cruelly cut short with a horrific tackle and broken shin. The club had just gone three matches without a victory, and our season was already on the brink. Thankfully, Smudger has come back in and the faithful old duo has rekindled their magic up front. Martin Grehan hasn’t missed a beat leading the line as our experienced General, finding the net more in our time of need. Elsewhere, we are beginning to really gel as a unit having made some slight tweaks to play faster and more direct football – no longer can opponents sit back and hold on to a point, we’re forcing them to come out and hitting them on the break with stunning regularity. 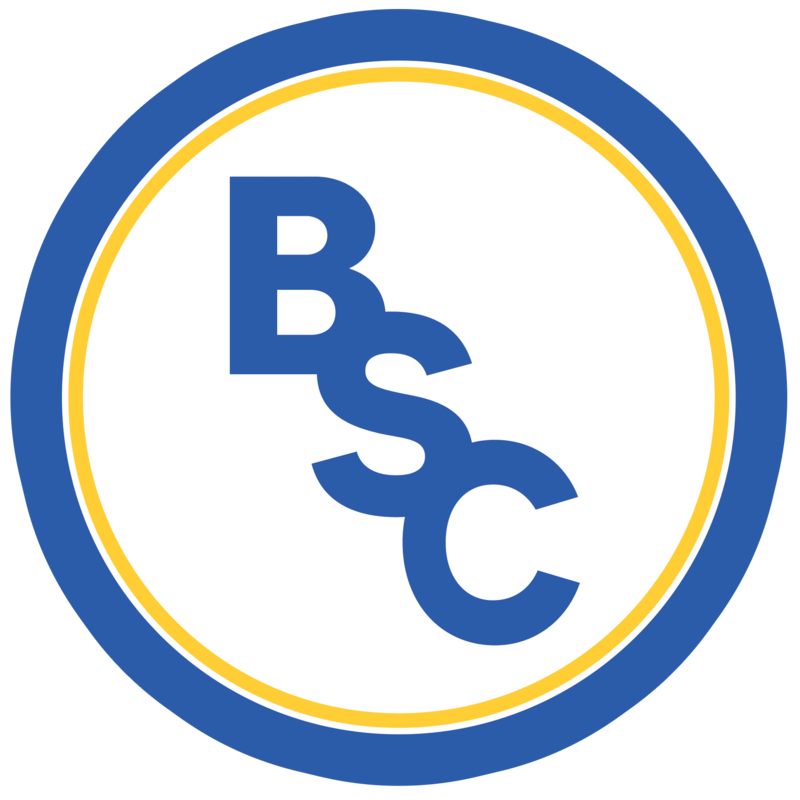 It’s clear to see the big disappointment in our recent run of games: for the second year running, we have fallen out of the Scottish Cup with a whimper to Highland League opposition. This time, we somehow conspired to throw away a two goal lead, and ultimately were hit by a sucker punch when trying to avoid a replay and clinch the winner. The Chairman isn’t too chuffed that our balance sheet is in the red, and we’ve missed the big chance to bring in some prize money. 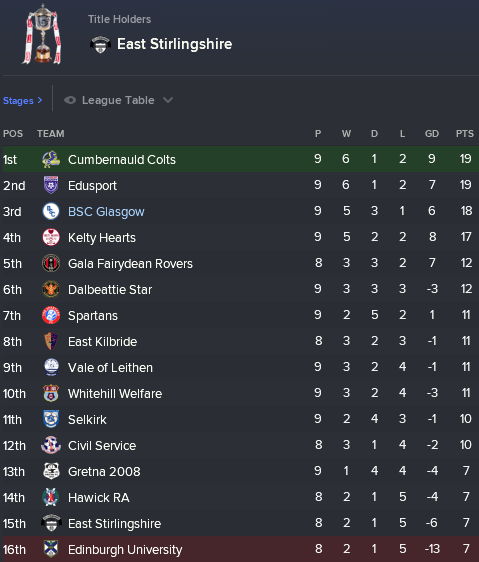 As we begin the festive run in, the first big test of our mettle arrived… we travelled to Broadwood to face league leading Cumbernauld Colts, knowing that only a win was acceptable. This group was put together to confront these challenges, and I was delighted to see my BSC boys play without fear in a comfortable victory that keeps us going. Our mission hasn’t changed – we’re title chasers! In the wake of this milestone, it seems a good time to assess the playing squad’s performances. One man sticks out at this time, and I’m delighted to say it’s our young centre half Aaron Morrison. Having learnt from his taste of first team football last season, he’s begun to really kick on with the help of Stephen Bronsky’s experience and advice. 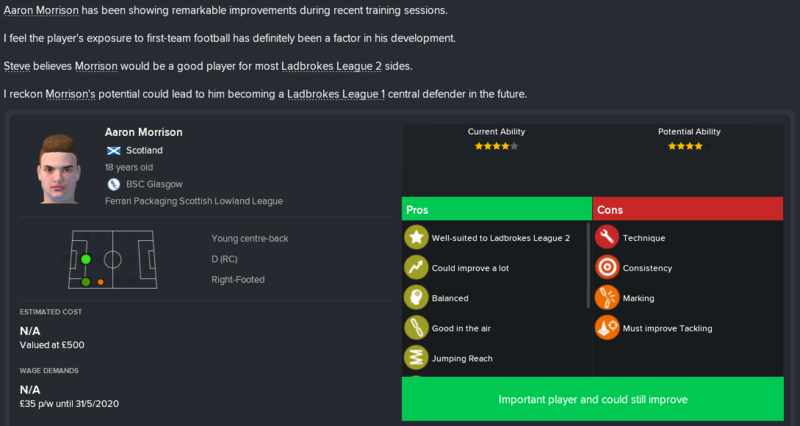 Our scouting team reckon he could comfortably play League 1 level in the future, but I think he should aim even higher. Hopefully it’ll be with this club as we continue to progress! There are seven league fixtures ahead before the January transfer window arrives. We’ll need to look after our remaining strikers, and Danny Stoney will have an opportunity to force his way back into the starting XI. If he performs, I might focus on strengthening elsewhere… my gut feeling, however, is we need to find an out-and-out goalscorer to reach the summit this time around. The top 4 are already beginning to break away from the rest – we’re joined by the Colts, Edusport Academy and Kelty Hearts. A visit from the Fifers is the highlight of our upcoming fixtures, which we approach with confidence looking to maintain our position and get as many points on the board as we can.